In this piece from Mountaineer magazine, we talk to Don Nguyen, founder of Climbers of Color, on perseverance and the importance of access to the outdoors. With just three days left in his 23-day, reality television ordeal, Don Nguyen was the very embodiment of the show’s title, “Naked and Afraid.” Cold rain and winds pounded and compromised his primitive shelter in the Namibian wilderness. As he shivered uncontrollably, in the buff and borderline hypothermic, he pondered an ending that he ultimately refused to accept. Nguyen’s father, Thuong, had been a prisoner of war, deep in the jungles of Vietnam. Now a doctor, he’d told his son tales of subsisting on rice and pumpkin, literally turning his skin a bright orange. When South Vietnam collapsed, he and his family fled, eventually relocating to Oklahoma City, which because of the influx of war refugees has one of the largest Vietnamese communities in the U.S. When encountering challenges like that bone-chilling night in Namibia, Nguyen reminds himself of all that his family has overcome. Nguyen, 30, has choices, even on mountain tops, where he makes his living as a guide and sees the racial composition of fellow leaders and climbers as being almost as white as the snow blanketing the slopes they ascend. He didn’t curse or lament the elevated dearth of diversity, though he generally saw climbing culture as closed and judgmental. He ascribed the lack of climbing mentors to the small community in Oklahoma City, but saw little difference, particularly for people of color, in the more alpine-centric Pacific Northwest. The first anchor of change was set in 2016 when Nguyen led a wilderness survival skills camp with Nicco Minutoli, a mixed-race freelance outdoor professional. The idea of Climbers of Color, to promote diversity in mountaineering and trip leadership, coalesced when Nguyen and Minutoli connected with fellow transplants Christopher Chalaka and Mariko Ching. Chalaka and Ching had previously founded Outdoor Asian, which seeks to reimagine outdoor spaces as more inclusive. 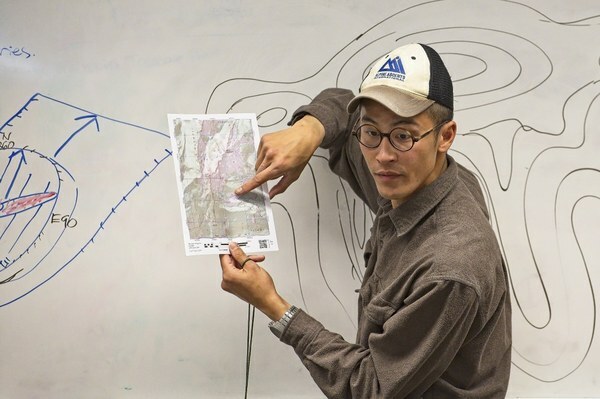 Don Nguyen demonstrates how to read a topo map. Photo by Glenn Nelson. The Seattle area offered a logical setting for this newest effort. Peaks sit minutes to a couple hours away in every direction. The region is home to Jim Whittaker, the first American to summit Mount Everest, as well as Sophia Danenberg, the first black woman to tag the world’s tallest peak. It’s also base camp for Rosemary Saal and Adina Scott, who were members of Expedition Denali, the first all-black ascent of the highest North American peak in 2013. The first, fee-free Climbers of Color mountaineering workshop, to “teach the teachers,” as Nguyen put it, was held nearly a year ago. Support was provided by Alpine Ascents, a mountain guiding outfit where Nguyen works, as well as Outdoor Research, Patagonia, and Petzl. Applicants were recruited solely through Facebook outdoor groups of color, then vetted for skill level and commitment to paying the training forward. 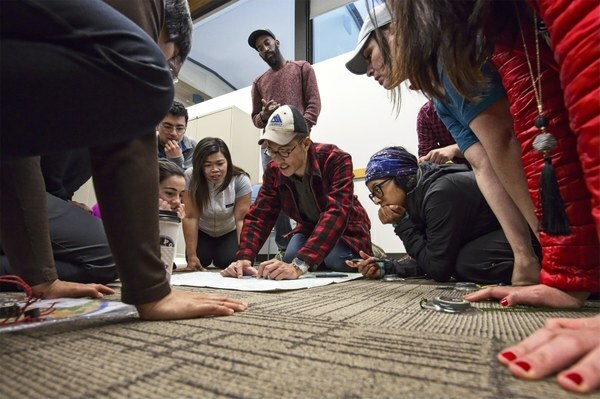 The first day of the two-day workshop was focused on navigational skills, but Nguyen also wanted to impart his do-as-I-do approach to outdoor leadership. From a tidy backpack to impeccable form, he stressed to the group that “you are ambassadors for people of color outdoors,” emulating the highest standards expected from professional guides, and, “if people see you doing it the right way, they’ll do it, too.” Nguyen likes to keep things light, referring to miles, for example, as “freedom units” (“there are countries that use the metric system,” he says, “and there are countries that went to the moon”). He also is thoughtful and meticulous in his preparation, evidenced by his reputation for being “book smart” on “Naked and Afraid.” In addition to his studies, he’d toughened his feet by walking in moccasins stuffed with sand, twigs, gravel, nut shells, and other forest debris. He also thru-hiked the 2,200-mile Appalachian Trail after college, choosing to do it solo to avoid the “virus of quitting” that can affect a group. “No one wants to quit alone,” Nguyen explained. On the second day, the group met at Mount Ellinor, on Washington’s Olympic Peninsula, where they held a mock guide meeting, practiced breaking trail in the snow and, with the assistance of Ching, learned to self-arrest falls with their ice axes. Nguyen continued to stress the importance of good pacing, his guiding pet-peeve. In a typical scenario, he explained, the strongest move to the front and the weaker members fall back and, soon, everyone is spread out. He told a story about a snowshoe trip at Mount Rainier where leadership assumptions went badly awry, resulting in two clients falling to their deaths in near darkness. “We want to be guides for everyone,” Nguyen said. Don Nguyen leads a talk on orienteering. Photo by Glenn Nelson. It may as well be the Climbers of Color motto: Inclusion is paramount, in every way possible. The organization has doubled its number of mountaineering leadership workshops to four for 2019, starting in April. It also has a new logo, a monthly People of Color Climbing Night at the Seattle Bouldering Project, and has held a climb for women of color as well as various meet-up climbs of local peaks. It’s been quite an ascent since the first off-and-on rainy afternoon of the group’s inaugural workshop early last spring. That day, a black man, Mexican American woman, and Filipino American man strolled together in a park that abuts one of the toniest neighborhoods in Seattle. The trio needed only to find one last landmark to complete their navigational exercise. Gabe Juzon, a yoga instructor and Lululemon ambassador, decided to stash his compass, declaring that he’d eyeball the final checkpoint. “Practice your orienteering,” urged Matehuala, the Denver-based climber. “I am oriental,” Juzon replied, intentionally mishearing. They laughed, because they could. Theirs was a safe space for outdoorsy people of color, carved out of a large swath of whiteness. This article originally appeared in our Spring 2019 issue of Mountaineer Magazine. To view the original article in magazine form and read more stories from our publication, click here.